So, you have already had your little one vaccinated. But, does her vaccination routine cover diseases like diphtheria and pertussis? Have you heard of the DTaP vaccine? If these questions left you dumbstruck, let’s change that right now. Read our post and learn all about the DTaP vaccine here. DTaP is a common vaccine that helps kids develop immunity to three deadly ailments, diphtheria, tetanus, and pertussis (whooping cough), all of which are bacterial infections. Having DTaP vaccine at the right age and following an appropriate schedule protects your child from ailments and ensures his good health. Tdap is an immunization booster, which doctors administer after the DTaP vaccine, typically when the child is around eleven. The Tdap helps protect your child from diseases in her adolescence and adulthood (1). Diphtheria is a respiratory ailment that leads to breathing problems, heart problems or failure, paralysis, and even death. It’s an extremely contagious ailment, and it spreads through coughing and sneezing. Tetanus, also popular as lockjaw, occurs due to bacteria in the soil. Once the bacterium enters the human body, it releases a toxic substance that attacks the human nervous system resulting in muscle spasms and even death. Pertussis is a highly contagious condition that causes coughing spasms. In babies, it can lead to trouble eating and drinking normally. Pertussis can also lead to pneumonia, brain damage, seizure and death of the affected child. What Is The Recommended Schedule Of DTaP? It is very important to ensure your child gets appropriate DTaP vaccine doses at appropriate age and intervals. Here is a recommended DTaP vaccine schedule. 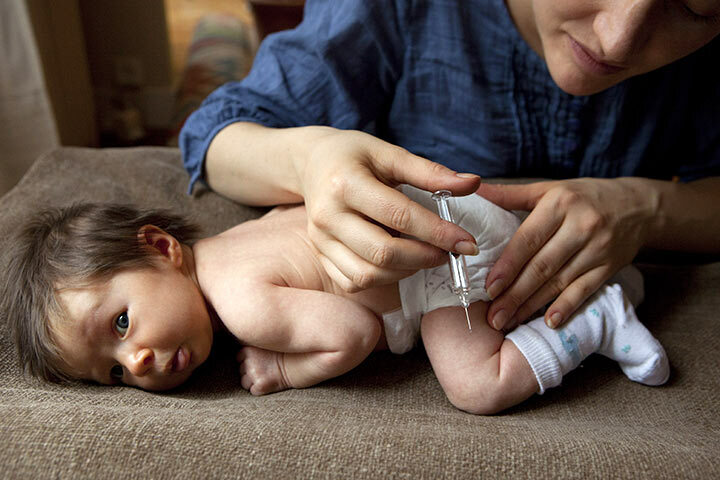 Five shots of DTaP vaccines are necessary between birth and age 6. One shot of Tdap when the child turns 11 i.e. between age 11 and 12. One shot of Tdap when the child turns adult. One Td booster every ten years. If you have never taken a Tdap booster, or if you are pregnant, consider getting a booster shot now. What Are Potential Side Effects Of DTaP Vaccine? There are no side effects of diphtheria and tetanus vaccine. However, the pertussis part of the vaccine can lead to some side effects. The effects include a mild fever and swelling, soreness, and redness at the injection site after having the fourth or fifth dose of DTaP vaccine. If you notice your child suffering from any side effects, consult your doctor. At times, your child may also suffer from fatigue, fussiness, and vomiting after having the vaccine. Allergic reactions are rare, but if you observe any then see the doctor immediately (3). How To Minimize DTaP Vaccine Side Effects? If your child is moderately or severely down with any ailment and if you have dtap vaccination schedule for her, wait until she recovers. Let your child have the vaccine after she recovers from the ailment and weakness so that she can tolerate the side effects, if she faces any. Did you give your dear little one DTaP vaccinations? Did she suffer any side effects? How did you treat these side effects post vaccination? Share your experience with the fellow mommies here. Leave a comment below.